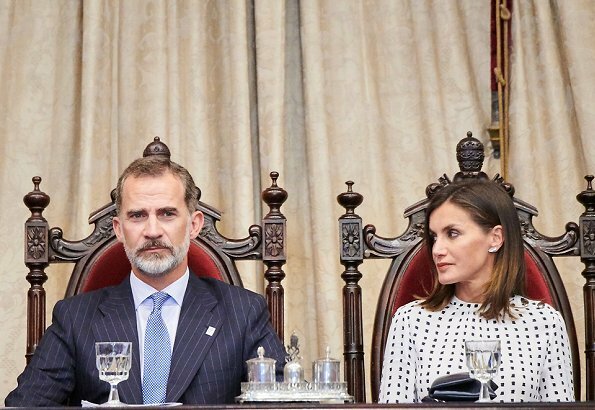 On September 18, 2018, King Felipe VI and Queen Letizia of Spain visited Salamanca city today. 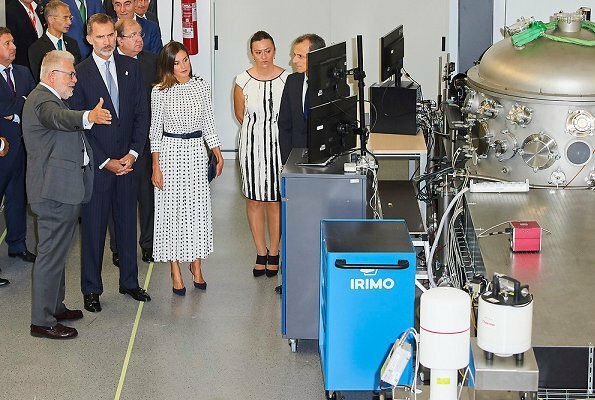 The King and the Queen firstly visited Pulsed Lasers Center and attended the opening of VEGA-3 Laser System. 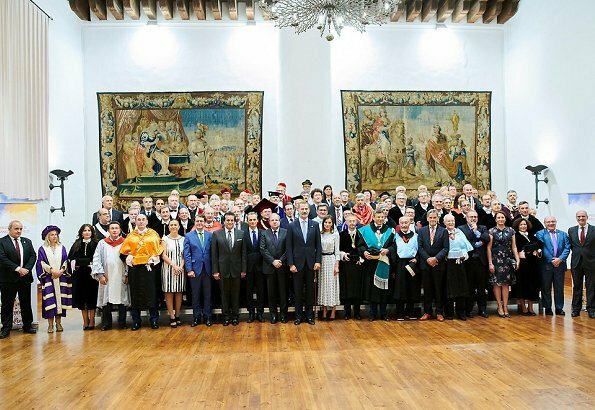 The King and the Queen then visited Salamanca University and attended celebrations of 30th anniversary of signing of "Magna Charta Universitatum" which approved the freedom of research and education. I am certainly a Letizia fan, but this is a real miss for me. The dress seems too big for her small frame and while her hair is healthy looking, it has become rather blah lately. The dress does no good to her petit figure. Besides, the pattern doesn't fit a queen in her mid 40s. The model conveys the spirit of the dress well. This is a big miss for me. The pattern is too dizzy, the skirt is too long and it’s just an altogether bad dress for her. Letitia looks better in bolder colors. Also, stilettos with midi length skirts just aren’t a good look. Agree that the dress looks too big on her. Que raro ese vestido no le queda bien y el cabello brilla pero tiene algo.. ..
Que viajan en helicoptero, Salamanca esta a 218 kms de Madrid. Quite nice esemble but to long. This is the comment I want to support. Yes a bit too long. I admire Letizia, but this dress looks like a perforated plate. This dress would look far better if it had a V neckline. Also the skirt is too long and has too much fabric for Letizia's small frame. It overwhelms her. I like it but it is too much on her small frame. I like the dress, the size of the dress and all the complements, for me just only the hair is "diferent" on last days not so beautifull but "Ok". Precioso vestido, muy fluido y femenino, con un gran movimiento. Me encanta. No lo veo grande en absoluto, los hombros y la cintura están exactamente en su sitio. Magníficos los pendientes Chanel y los zapatos. 10/10. De acuerdo 100% contigo Angie, siempre tan educada. I disagree with the perception that the dress is too big for her. It fits perfectly in all the right places, shoulders, bust and waist. The length it's totally on trend, obviously not to everybody's taste. Love the entire ensamble, chic and appropriate. The dress fits her, so it´s not technically too large, but I agree that it overpowers Letizia´s frame. We are not used to seeing midi-length skirts or dresses on her, and I hope we won´t again in the future (and not on anyone else either for that matter). This length is just not a flattering look. But if you have to wear it, at least style it super-casually with flats and a simple top. Heels are definitely wrong for this look. Those very ugly buttons on her shoulder instantly make me think of kids´ clothing, and that´s not what I want to see on a queen. 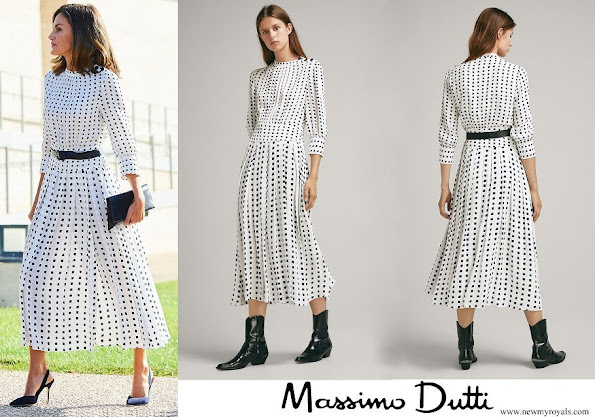 The high neck and long sleeves (and the white colour) makes me think of a nighty, and that´s not good for a queen either. The polka-dot all-over print isn´t bad as such, but in order to look sophisticated on a grown-woman, it needs a shorter dress (ideally sleeveless or at least short sleeves) and a sassy cut. These comments are a bit ironic. When Sophie Wessex wears dresses like this and longer, but a more matronly style, she is praised. I don't mind seeing Letizia wearing this. It could have come up a few inches, but it still works. Because Letizia is small doesn't mean she can't wear a fuller skirt. The bodice of the dress fits her well. I also like the subtle print. I don't agree that she shouldn't wear stilettos. What else should she wear? She is not going to a picnic. Flats would make this much too casual. 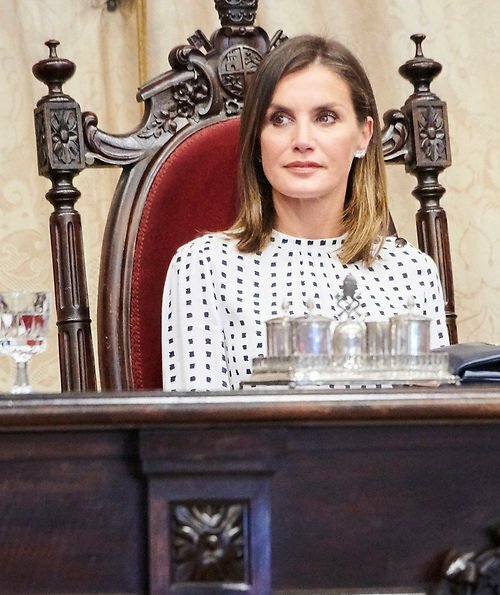 The dress wears Letizia, she isn’t. And the way the pattern falls on her chest is completely unflattering in any silhouette. Also too long for her petite body. Very few women can pull of this length. It’s also unflattering for tall people. You have to be just the right height for it not to swallow you or not look like a you bought a full length maxi in one size too short. In particular in this cut. Me gusta el estilismo, está muy elegante .Quizás el vestido algo largo.